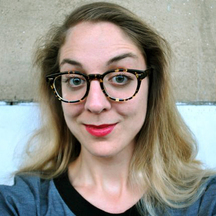 Frédérique de montblanc — Director Born and raised in Brussels, Frédérique went on a long artistic journey that brought her first to Montreal where she completed her BFA in Theatre at Concordia University in 2004. She then flew to Los Angeles to further her interest in video art, performance and set design. She obtained her MFA from CalArts in 2007 then moved to Texas where she worked on several projects with the Dominic Walsh Dance Theater, Pascal Rambert and the Mercury Baroque Music Ensemble. Since she's been back in Europe, she has created the sets and costumes of I Would Prefer Not To by Selma Alaoui (Theatre les Tanneurs, Brussels) for which she was nominated at 'le Prix de la Critique 2010-11'. Her set design work also includes Les Buveuses de Cafe by Compagnie Mossoux-Bonte (Theatre Romain Rolland, Paris), and more recently The Two Character Play by Tennessee Williams directed by Sarah Sire (Théâtre Océan Nord, Brussels) as well as Mas-Sacre choreographed by Maria-Clara Villa Lobos (Theatre les Tanneurs,Brussels). Her video work includes short films and video installations which she has shown in several galleries and art centers in Los Angeles, Brussels, Houston and Paris : Ainsi Fonfonfon (2007), Unfortunate Drinkypoo (2008), Auf Deutsch please! (2010), La Salle à Manger (2011), Suite 560 (2012), Héroïnes (2013). Her short film La Cave (2010) was presented on the TV channel of Arte Creative in 2012.